Be the first to share your favorite memory, photo or story of Sandra "Sandy". This memorial page is dedicated for family, friends and future generations to celebrate the life of their loved one. Sandra “Sandy” Kay (Porter) Rogers, age 66, of Washington, PA., (formerly of Claysville, PA.) passed away at Washington Health System, Washington, PA., with her family by her side. Born January 1, 1952 in Wheeling, WV., she is the daughter of the late Harold Blaine and Mabel Virginia (Minor) Porter. Sandy was a resident of Claysville, PA until 1992 when she moved to Washington, PA where she resided until her passing. She graduated from McGuffey High School in 1969 then went on to attend Penn State for one year. 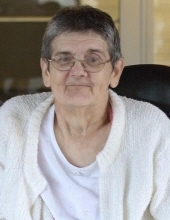 Sandy was a member of Friendship Community Church in Washington, PA. She worked as a nurse’s aide for Humbert Lane Personal Care Home, in Washington, PA for seven years until she retired in 1999. Sandy was a member of the West Alexander American Legion Women’s Auxiliary Post #656 and Claysville Volunteer Fire Department Women’s Auxiliary. She enjoyed reading her Bible and visiting family and friends. She is survived by, two sisters, Mabel Jean Porter, of Claysville, PA. and Barbara Mounts, of Washington, PA; two nephews, Patrick Mounts, of Washington, PA. and Scott Mounts, of Claysville, PA.; great-niece, Stefani Mounts, of West Alexander, PA.; great-nephew, Andrew Mounts, of West Alexander, PA. In addition to her parents, she was preceded in death by her husband, Kenneth Wayne Rogers, who passed away September 23, 2009. Friends will be received on Friday, November 9, 2018 from 11:00 AM – 1:00 PM at West Alexander United Presbyterian Church, 303 Main St., West Alexander, PA 15376. A funeral service will immediately follow at 1:00 PM with Pastor Tim and Amy Florence and Pastor Rick Bruckner, officiating. Burial will follow at Claysville Cemetery, Claysville, PA. In lieu of flowers, memorial contributions may be made to Friendship Community Church, 1090 Weirich Ave., Washington, PA 15301, West Alexander United Presbyterian Church, 303 Main St., West Alexander, PA 15376 or West Alexander American Legion Women’s Auxiliary Post # 656 at 8 W. Main St., West Alexander, PA 15376. To send flowers or a remembrance gift to the family of Sandra "Sandy" Kay (Porter) Rogers, please visit our Tribute Store. "Email Address" would like to share the life celebration of Sandra "Sandy" Kay (Porter) Rogers. Click on the "link" to go to share a favorite memory or leave a condolence message for the family.